Lock in a great price for Hotel D. Luis - Elvas - rated 8.5 by recent guests. Great value for money, great installations, great staff. 10/10. Central location with terrace and views over the river. Clean & comfy rooms, good breakfast and very helpful staff who peak good english. This is our second visit to Elvas and our second stay in this hotel. The location is impressive just next to the beautiful Amoreira Aqueduct and 5 min away from Muralhas de Elvas. The breakfast is good but it would be good to have some variety. The lobby area is wide and well furnished. The location is also good if you plan to visit Spain. There is a huge shopping center El Faro 15 min away by car across the border. The hotel is very well located, with a great view for the monument. The staff was very nice and helpful. The hotel room is very cosy and clean. The location - right next to the aqueduct - was good, and rooms were quiet. Good breakfast with homemade croissants. Very nice and flakey. Nice view to the pool. Modern facilities, especially in rooms. Large bed and good room temperature. Interior design of the lobby and public areas. View from the window facing aquaduct. 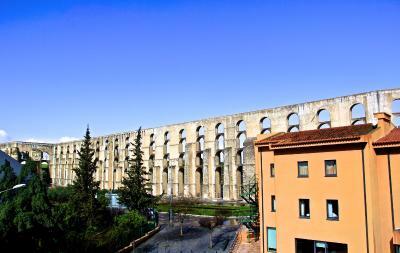 Our room was facing the aqueduct! Busy street but quiet at night. Comfortable beds. Easy parking. Walking distance to old town. The walk is uphill to the centro and castelo which might be an issue for some. Very convenient location to drive to the fortresses. We even made a side trip to Badajoz. Breakfast offer was good. WiFi and TV good. One of our top picks in Elvas.Facing the imposing Aqueduct of Amoreira in Elvas, a UNESCO World Heritage site, this hotel features spacious guest rooms and a garden with a seasonal swimming pool. The property was fully renovated in 2016. Badajoz is situated 8.7 miles away. All rooms have views over either the Aqueduct, the garden or the swimming pool area. The elegantly decorated rooms at Hotel D. Luís have a flat-screen satellite TV and air conditioning. Each room includes a private bathroom, stocked with a hair dryer and free toiletries. A breakfast buffet is served daily in the breakfast room or on the spacious terrace facing the seasonal swimming pool. 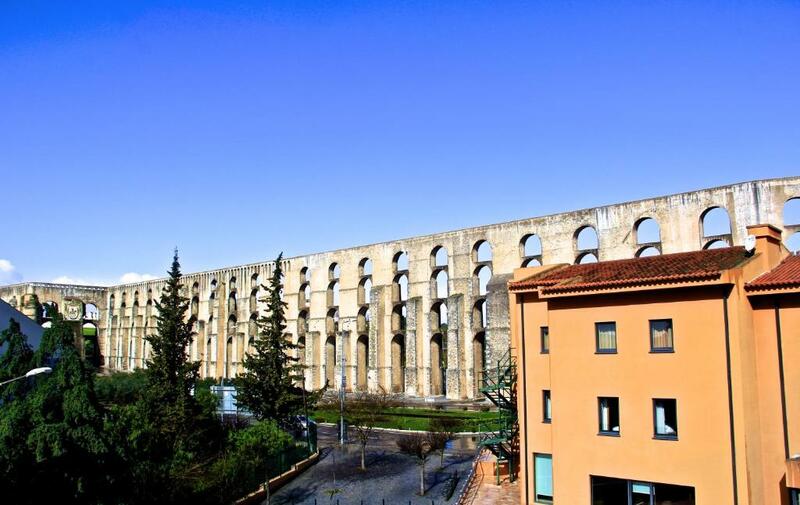 Drinks and sandwiches are available at the adjoining EME bar, which has a direct view to the Aqueduct. The 24-hour reception staff can arrange car rentals and offers a daily newspaper service in the hotel’s living room. The friendly staff is also available to help out guests plan their visit to Elvas, a UNESCO World Heritage site. Lisbon is a 2-hour drive away, and the nearest golf course is 15.5 miles from the property. The Santa Luzia Fortress and its Military Museum is 0.9 miles away. 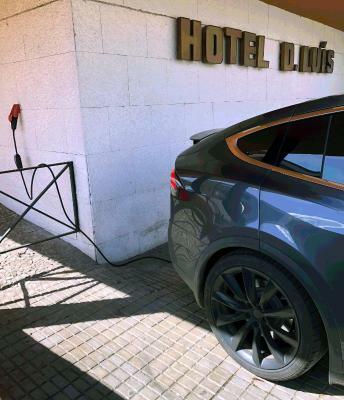 Free public parking is available for guests of the Hotel D. Luis. Hotel D. Luis - Elvas has been welcoming Booking.com guests since 8 Jun 2009. When would you like to stay at Hotel D. Luis - Elvas? This suite includes a hydro-massage bath. Featuring air-conditioning, a flat-screen satellite TV, desk and surrounding views. This bright double room offers a private bathroom, flat-screen satellite TV, work desk and air conditioning. The room includes an extra bed. House rules Hotel D. Luis - Elvas takes special requests - add in the next step! Hotel D. Luis - Elvas accepts these cards and reserves the right to temporarily hold an amount prior to arrival. Please note that WiFi access is available only at the lobby. The time for check out. The room, the bed and the location. Everything, especially the location, decoration of hotel, room interior, free parking, breakfast. . . The breakfast could be better, with more options. Well I understand why you have bathroom lights on a timer but I prefer not to have my shower in outer darkness half way through. Also my gps sent me the wrong way down your road. Gps coordinates would really help. Comfortable, quiet, fantastic view of the aqueduct across the road, free parking across the road, very helpful receptionist- great all round. Area has limited options for dinners. We didn't get one of the rooms we had booked, although after discussing this with staff the next day they did refund the difference. Also be aware that the free parking is just in an open public parking area over the road. Breakfast is ok but falls short to those hotels which prepare homemade. Location: not in town, but at the main road around Elvas (so you get View to the magnificent aqueduct) but you must walk into Elvas (10-15minutes) old town. Very friendly and helpful staff. Spacious room. Wardrobe. Well kept up to date interiors. Good value for money. Location: With easy car park it makes a good basis for exploring Elvas - Vila vicosa- Evora - Mérida (Spain) and surrounding. Elvas being connected to the main motorway. For some the walking into Elvas old town of 10-15 minutes might be a con (see below) but it was not an issue for me. The bathroom had a shower base with a half glass protecting the shower to spill water to the floor but it was not very effective since the floor got wet despite our best efforts to keep it dry.